A 14k gold ring can become a piece of art with the right inspiration, as the new Ana Luisa Voyage Rings Collection shows. Inspired by a cruise on the Nile, the rings in this exotic and breathtaking collection were designed with the lavish Egyptian jewelry in mind. The Ancient Egyptians were an impressive civilization and so was their jewelry. They valued it a lot and both women and men used to wear it, regardless of their social class. Egyptians viewed jewelry as a symbol of status and power and they had different rules for wearing various metals and gemstones. So without further ado, we invite you to a fascinating journey through history to learn about Egyptian jewelry and what it meant to people thousands of years ago. The Egyptians were among the first people to craft and wear jewelry made of precious metals. Though silver was quite rare at the time, they had plenty of gold and copper. 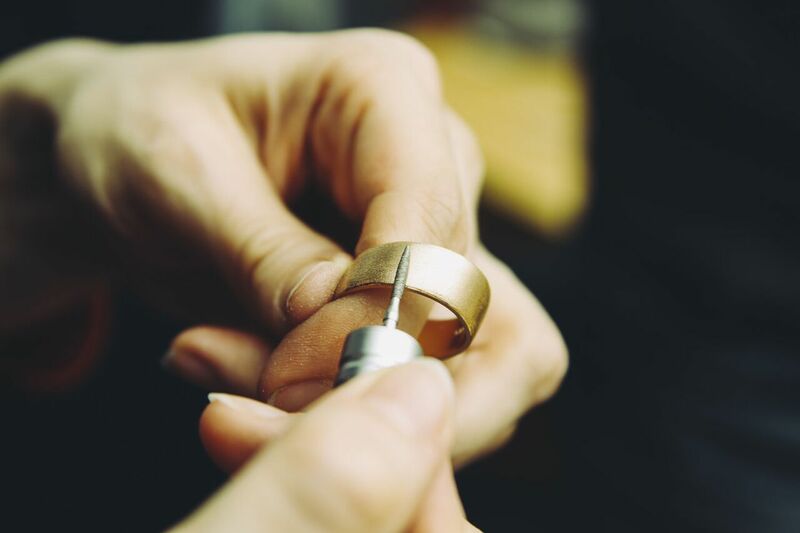 They used to create the jewelry in workshops and, most of the times, more than one individual worked on a single piece. Gold jewelry was worn by wealthy and influent people, while copper one, which was more affordable, was worn by the masses. As you may know, their favorite stone was Lapis Lazuli which they used to craft the famous Egyptian Scarab. Paying attention to the scarab’s reproduction cycle, they Ancient Egyptians associated this beetle with rebirth and regeneration. Thus, it became the symbol of their sun god, Ra. Besides Lapis Lazuli, they also used obsidian, rock crystal, pearls and emeralds in their jewelry. To the Egyptians, each gemstone had a protective and/or healing power and they wore jewelry to ward off evils spirits or bring luck to their households. Jewelry creation in Ancient Egypt was very close to a religious ritual. Jewelry makers had a very high social standing because it was believed they were chosen by the gods to craft the jewelry. Inspired by the mystic legends surrounding Egyptian jewelry, we have created a collection of breathtaking 14k gold-plated rings. All the items are limited edition, so make sure to get yours as soon as possible. 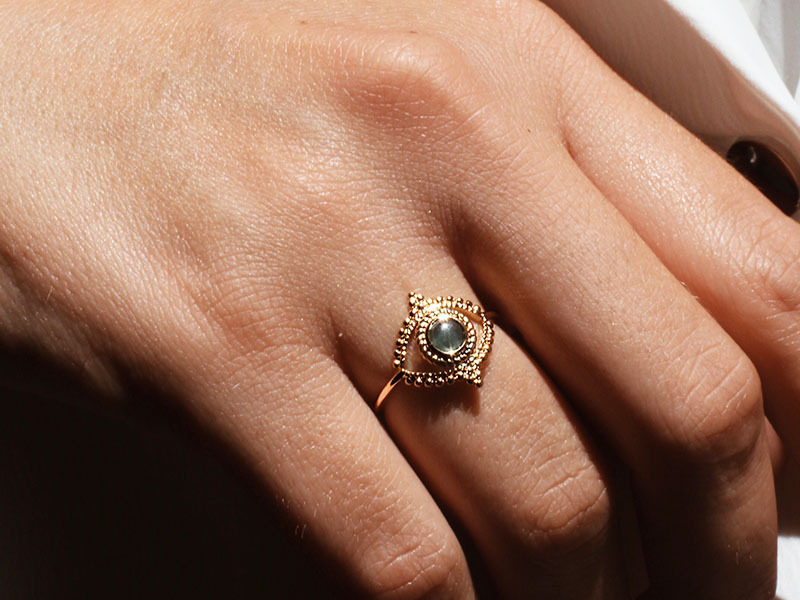 Dipped in 14k gold, Nito ring was inspired by the Ancient Egyptian royalty jewelry. Nitocris is believed to have been the last pharaoh of Egypt. The ancient historian Herodotus wrote about her having avenged her brother’s murder at a banquet she threw to capture his murderers. While there aren’t a lot of details about Nitocris, the elusive supposedly last pharaoh of Egypt, her story was enough to inspire us to create a royalty gold plated ring with an imperial porcelain centerpiece. Fit for a queen or goddess, this 14k gold ring will draw attention to your outfit and bring unparalleled elegance to your style. Kiya represents one of the historical puzzles which any historian dreams to solve. What we know about her, besides her name, is that she was an ancient Egyptian queen, one of the wives of Akhenaten. You may not have heard of him, but you have surely heard about his most famous wife, Nefertiti. Kiya’s existence was discovered when archaeologists uncovered artifacts and monuments dedicated to her by the pharaoh with the title “the Favorite”. Our Kia ring resembles the mysterious Kiya princess. A 14k gold-plated artistic piece with a green porcelain centerpiece, this ring was created for a mysterious and elegant woman. The most famous Egyptian queen, also known as the most beautiful one, inspired us to create this lavish superbly handcrafted ring. Dipped in 14k gold with a beautiful design resembling the Egyptian sun, this ring represents the coronation of femininity. Be a Nefertiti and showcase your refinery and elegance with this amazing 14k gold ring guaranteed to make you stand out from the crowd. “Iset” means “she of the throne” and it was the Egyptian name of the goddess known as Isis. She was the goddess of life, magic, and marriage and played a big role in Ancient Egypt’s religious rituals and beliefs. Our Iset ring was designed to symbolize her dual nature, balance, and mystery. This 14k gold plated ring with a unique design is fit for a true goddess who loves delicate and elegant jewelry pieces. 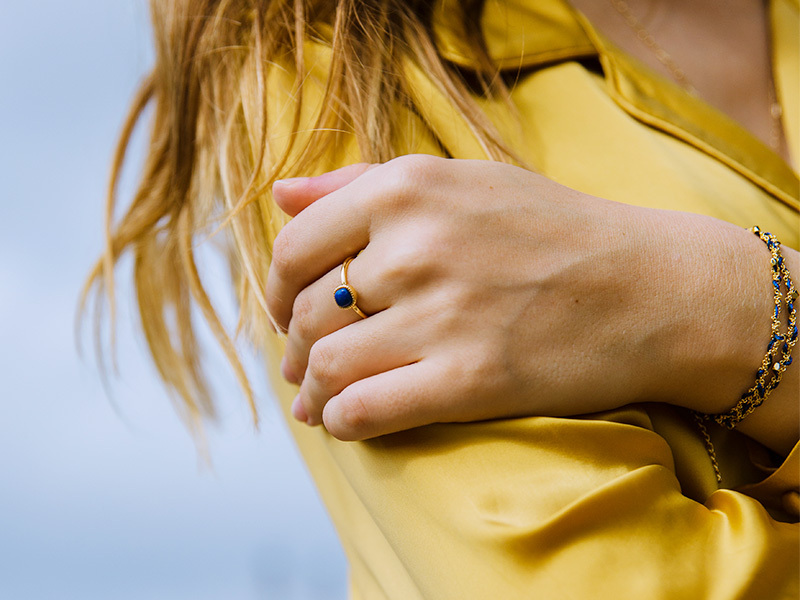 This amazing gold plated ring features a central celestial blue Lapis Lazuli gemstone and a simple yet elegant design. Lapis Lazuli was the favorite gemstone of ancient Egyptians who believed it symbolized wisdom and truth. 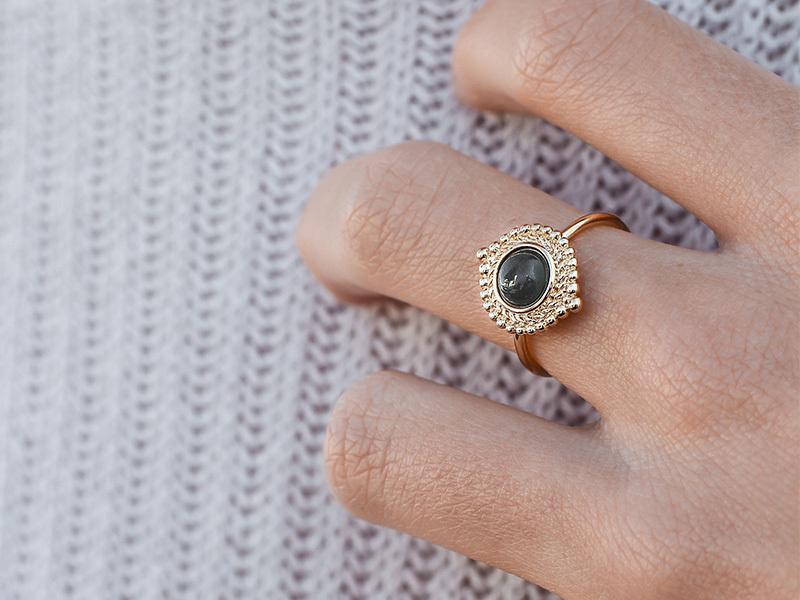 Wear the Jin ring to get a sophisticated royal look and to complement any elegant outfit. Discover our breathtaking goddess rings collection here and choose your 14k gold ring from five unique designs. Let yourself be inspired by the mystery and elegance of Ancient Egypt. For more style and inspiration articles read our dedicated section on this blog.